The journey below takes you over the beautiful Reitdiep, a former estuary to Groningen. Nowadays there are several locks and bridges between Lauweroog and Groningen. This trip can be sailed both ways, either from Groningen to Zoutkamp or from Zoutkamp to Groningen. Zoutkamp is a small fishing village with a good connection via public transportation. However, if you prefer we could arrange the transportation from or to Zoutkamp for you. 12.00 Arrival aboard and a delicious lunch will be ready for you. 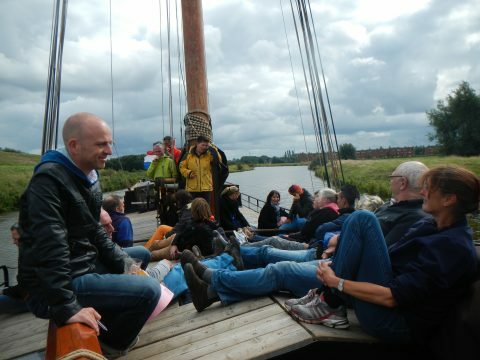 13:00 After a brief instruction about life aboard and sailing from the skipper we set off heading for Groningen across the Reitdiep. The former estuary meanders through the scenery of Groningen. On the banks there are several farms, wonderful reeds and occasionally some wildlife in the form of deer, birds of prey and hares. The Reitdiep takes us past several small villages and beautiful views. 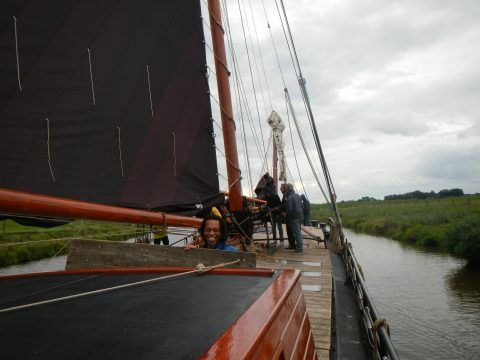 Because it is a former estuary the Reitdiep has a lot of curves, which means sailing is active, we will be pulling the sheets and hoisting and lowering the sails. 16:30 While we have a quiet stretch or briefly sail on the engine some drinks will be served accompanied with some snacks. 17:30 We draw nearer to Groningen and the university buildings can be seen at the horizon. First we will sail through the Dorkerwerdersluis (the last lock before the city) and the last parts of country life are to be seen before entering the city. We sail through some quarters of Groningen, each with their own charms. As we almost enter the centre a monumental water tower is on the right bank, several houseboats on both sides of the canal and the water increasingly gets narrower. 18:30 We moor at the Hoge der Aa, many old warehouses remember us that a lively trade used to take place in this port. These wonderful houses nowadays are restaurants, student housing or shops. Here our journey ends, in the city centre of Groningen. It is possible to have diner aboard afterwards. The trip above is merely an example, in consultation with us the trip can be personalized to your preferences.